Banana has been prized for thousands of years for its nutritional value and pleasing taste, not to mention its many medicinal uses. Find out all that banana has to offer! A perennial herb originating from Southeast Asia, banana can be traced back for centuries, and evidence indicates that it was first domesticated in what is now New Guinea, around 8000 BCE. Bananas are now a common sight in most households, where they have become a staple because of their sweet taste and nutritional benefits. Regulating digestion. Conditions like diarrhea, dysentery, and ulcers can be improved by consuming bananas. Improving cardiovascular health. Bananas help the body control blood pressure and cholesterol levels. Soothing burns and irritation. Bananas can be applied externally to help minor burns, insect bites, and other skin irritations heal quickly. Improving mood. Eating bananas helps the body produce certain mood-boosting neurotransmitters. The water-soluble pectins and fructooligosaccharides (FOS) in bananas are the components responsible for its digestive properties. The pectins normalize the digestion of carbohydrates, while the FOS are metabolized in the lower intestine and help promote balance of healthy bacteria in the gut. 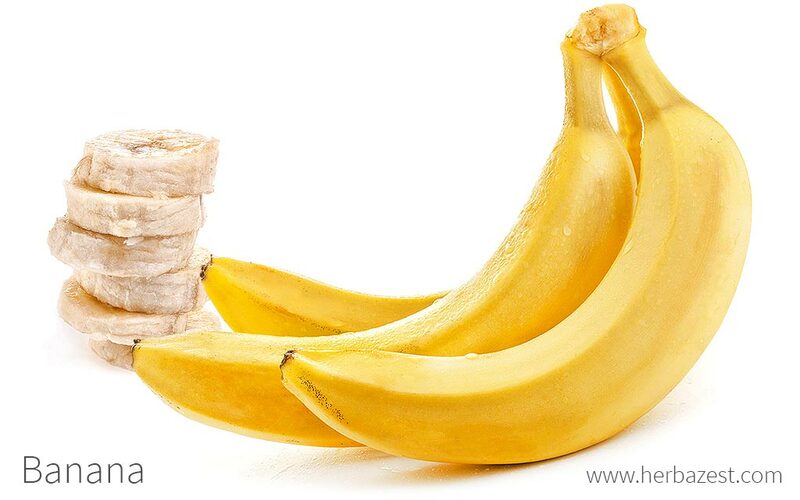 Additionally, recent research suggests that banana's leucocyanidin can help prevent the formation of ulcers. Bananas contain tryptophan, which aids in the production of serotonin, dopamine, and norepinephrine, three neurotransmitters that generate feelings of well-being and happiness. Consuming bananas also helps lower cholesterol because of the sterols found in the fruit. Sterols block the absorption of cholesterol in the intestines, lowering the body's overall levels. Bananas are also a good source of dietary fiber, which not only delays glucose absorption, therefore preventing sugar spikes, but it is known to reduce blood cholesterol as well. Tannic acid, another component in bananas, soothes skin ailments and is commonly used in drugs manufactured to treat burns, insect bites, rashes, and hemorrhoids. Cardioprotective properties are also present in acai and soy, whereas pear and peppermint provide similar digestive benefits. While bananas are mostly safe for consumption, they are also very high in potassium, and eating too many could cause an excess of potassium in the body, called hyperkalemia. Symptoms of hyperkalemia include irregular heartbeat, fatigue, and possibly paralysis. However, the development of this condition would require the consumption of an extremely large number of bananas, so those who maintain a balanced diet should not experience any problems. Bananas may interact dangerously with medications such as ACE inhibitors (used to treat hypertension), certain diuretics, and oxazolidinone antibiotics, so they should be avoided by people taking any of these drugs. Bananas may also interact with alcohol to aggravate migraines. Additionally, bananas are a known allergen. Symptoms of a banana allergy are likely to appear moments after ingestion or contact, and can include stomach cramps, diarrhea, vomiting, runny nose, watery eyes, headaches, itching, sneezing, wheezing, and possibly anaphylaxis. Contrary to popular belief, bananas are not only low in calories; they contain no fat, cholesterol, or sodium, and provide important nutrients. The most abundant vitamin in bananas is B6 (pyridoxin), which is crucial for brain development and function, as well as for enhancing mood and regulate sleep cycles, also aiding with the proper absorption of vitamin B12 and with cells production. Bananas are also a good source of manganese and vitamin C (ascorbic acid), also containing fair amounts of other nutrients, such as copper, potassium, and magnesium, as well as other B-complex vitamins, namely B2 (riboflavin), B5 (pantothenic acid), and B9 (folate). While the truth is that this popular fruit is not particularly rich in potassium, a medium-sized banana provides adequate amounts of this mineral, important for controlling body's fluid balance, muscle contraction, and transmission of nerve impulses, as well as for the proper function of heart and kidneys. 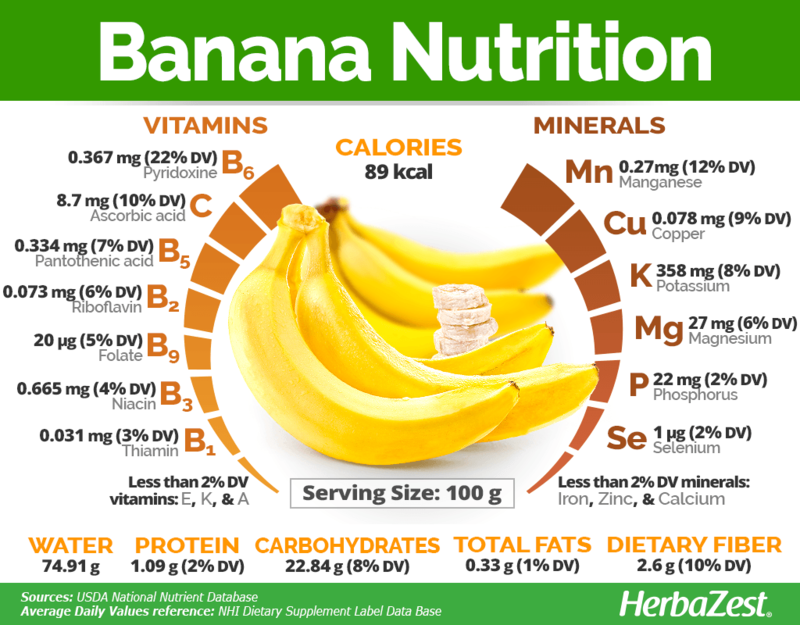 100 grams of banana provide 89 calories and 10% of the daily value for dietary fiber. Although bananas are most commonly thought of as a culinary ingredient, they can be consumed in several different remedial forms. 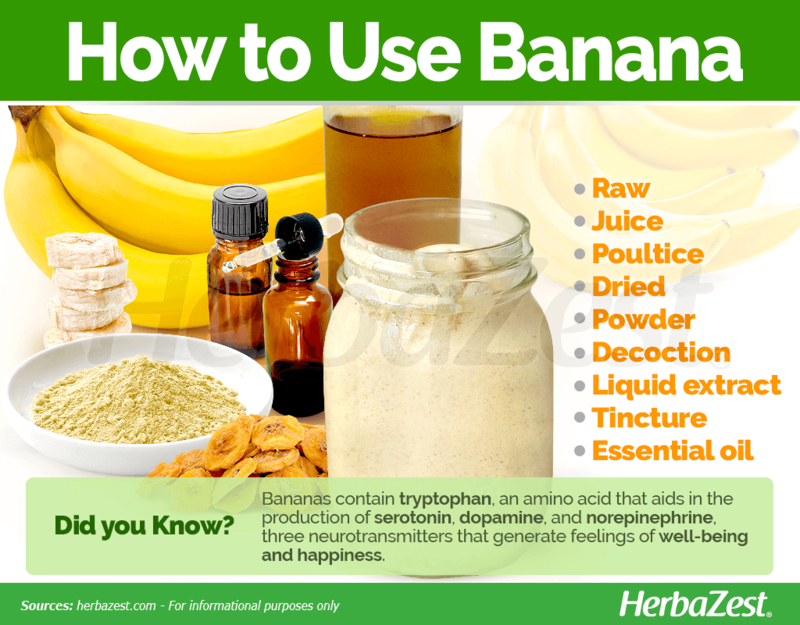 All of the many ways to prepare banana will provide a number of the banana's signature health benefits. Bananas are often pureed for use in baby food, but are also pureed to make jams and milkshakes. Raw. Ripe bananas are often eaten alone for their strong cardioprotective and digestive benefits, but they can also be added to smoothies, or used in a number of other ways. Adding the peels to smoothies, as well as the fruit, helps alleviate stress and bad moods. Juice. Banana stem juice is excellent for lowering cholesterol and blood pressure, as well as for regulating digestion. Poultice. When used externally, the pulp and peel of banana can soothe sunburns and insect bites, relieve pain and itching, and moisturize the skin. Dried. Bananas can be dehydrated and preserved for later consumption. Eating banana chips as a snack is great way to reap the nutritional benefits of this fruit. Powder. Powdered banana is often sold as an easy smoothie ingredient, but it also contains all of the cardioprotective and digestive benefits of bananas, as well as the many vitamins and minerals found in the fruit. Decoction. Banana peels can be boiled to make a concentrated beverage that naturally tastes sweet and also helps to lower cholesterol, improve digestion, and improve mood. Liquid extract. 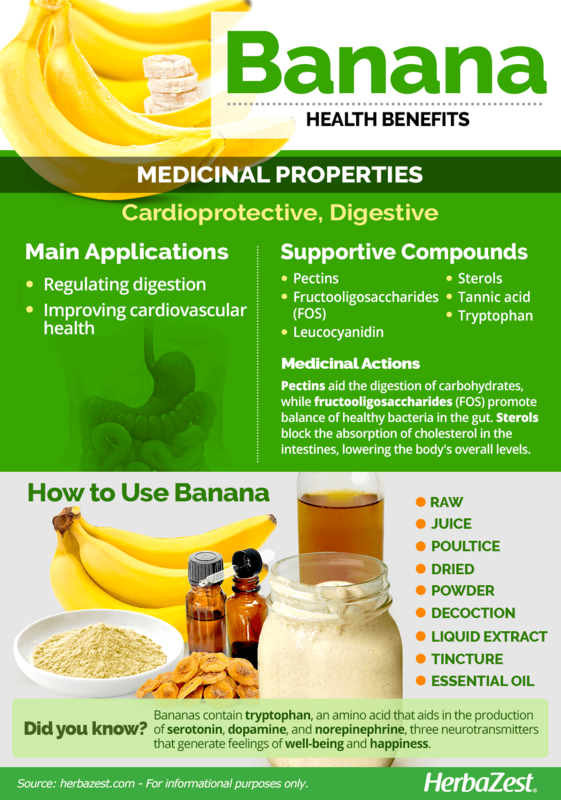 While banana extract is often used as aflavoring agent, it can also be applied to the skin for the same healing benefits as banana tincture and oil. Tincture. A tincture made from banana peels can be applied externallyto insect bites or other skin irritations to soothe pain and itching. Afew drops can also be added to a drink to help promote healthy digestion. Essential oil. Banana oil should only be applied to the skin, and it can help to soothe and heal small burns, rashes, and other skin ailments. Bananas are available all year in grocery stores and farmers' markets worldwide and are usually sold in their natural bunches. Baked goods containing banana are also available in the same places. Although bananas are usually bought fresh, several other forms are also available, such as pureed and dried. Dehydrated banana is slightly less common, but it can still be found online and in some grocery stores. 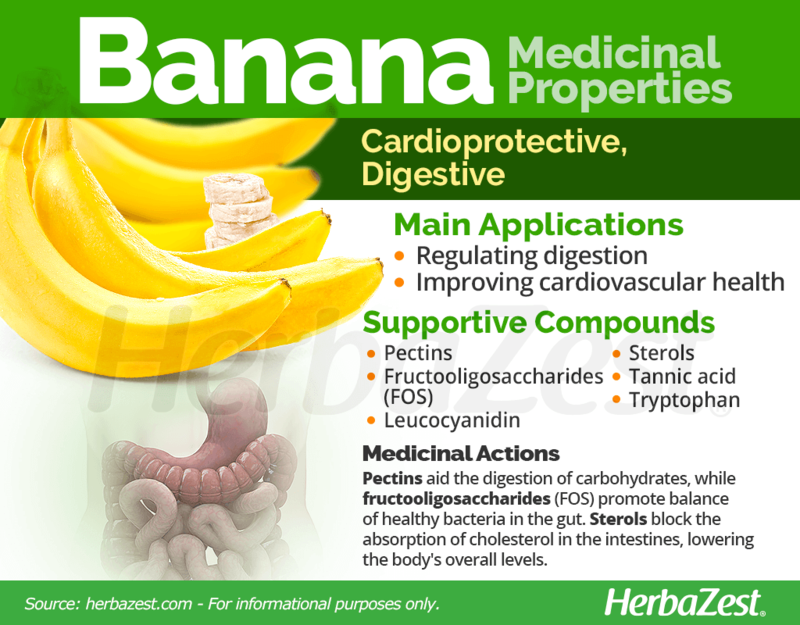 Banana supplements can be found most easily through online retailers, but many will be available at specialized health stores. Additionally, many of banana's medicinal forms are simple to make at home using fresh bananas found at the grocery store. Banana is a perennial plant resembling a tree that is commonly grown in tropical areas for its healthy fruits and as an ornamental addition to yards. Because they are tropical plants, bananas cannot be grown outdoors in cold or even temperate environments. In order to produce good-quality fruit, the banana plant requires specific conditions and care. Banana plants are most commonly propagated by cuttings because modern edible varieties have been bred to be seedless. Ideally, bananas should be grown in well-drained, moist soil that is rich in organic matter, but many cultivars are capable of thriving in sandy, loamy, rocky soils provided there is sufficient drainage. While bananas can survive in partial shade, planting a banana tree in full sun ensures the best quality fruit. Bananas are highly susceptible to drought and must be watered frequently; however, they are not tolerant of flooding or overwatering. Bananas must be harvested 7 - 14 days before ripening, as they taste better when ripened off the plant. Bananas are susceptible to several pests, including banana borers and sugar cane weevils, as well as to diseases, such as Panama disease and sigatoka fungus. More detailed information about growing banana can be found in the herb garden section. Although the banana plant is colloquially referred to as a tree, it actually has a pseudostem made of tightly-woven leaves rather than a woody trunk. The banana plant can reach up to 25 feet (7.5 m) tall depending on the cultivar, and it has leaves that may grow up to 9 feet (3 m) long and 2 feet (60 cm) wide. Depending on the cultivar, the leaves could be completely green, or could be a mix of green and other colors, such as red or maroon. The fruit, which is actually an elongated berry, appears from the groups, or hands, of flowers that grow on the stem. Banana plants also have a large underground stem called a rhizome and an extensive network of roots that can reach five feet (1.5m) deep and 16 feet (5 m) laterally. In many countries, a distinction is made between bananas and plantains, although different cultures create different ways to distinguish between them. In most English-speaking countries, bananas are sweeter and used in desserts, whereas plantains are starchier and used for cooking. However, there is no real botanical distinction between the two fruits; they are simply two names for different types of cultivars of the same plant. Bananas belong to the genus Musa and the family Musaceae. Most modern edible bananas are bred from Musa acuminata, although some are hybrids of M. acuminata and M. balbisiana. Edible bananas are seedless, unlike the banana's ancestors and modern wild relatives. The Musaceae family includes many species of wild bananas, all of which are inedible due to their large, stony seeds. Because modern edible bananas are the result of centuries of hybridization and selective breeding, banana taxonomy is complicated and there is no definitive way to classify all the many varieties and subspecies of banana. The cultivars derived from M. acuminata are generally sweeter and used as dessert bananas, whereas cultivars from M. balbisiana or hybrids of the two are usually used in cooking. The most commonly sold banana cultivar in the United States is called the 'Cavendish', which is derived from M. acuminata. Another popular cultivar is the 'manzana', which is named for the Spanish word for apple because it is said to produce an aftertaste that resembles the taste of an apple. Musa paradisiaca, commonly known as 'French plantain', is a popular hybrid of Musa acuminata and Musa balbisiana. The earliest known domesticated banana cultivar originated in New Guinea in about 8000 BCE. The spread of bananas is difficult to trace, but historians believe that edible banana cultivars spread rapidly throughout Southeast Asia and the South Pacific before reaching other continents. Interestingly, bananas are thought to have arrived in South America in 200 BCE, over a thousand years before reaching Europe in the 10th century. In the late 1800s and early 1900s, the banana became an important economic crop, popular for its taste, nutritional benefits, and cheap price. The most popular cultivar was the 'Gros Michel', known for its thick peel and strong taste. However, this cultivar was highly vulnerable to disease because every plant was genetically identical. The onset of Panama disease nearly wiped out the cultivar entirely, and the 'Gros Michel' disappeared as a commercial crop, being replaced by other cultivars. Bananas are a hugely important economic crop worldwide, ranking as the 5th largest agricultural food crop after coffee, cereals, sugar, and cacao. World production is around 100 million tons, and a massive 5 million hectares are set aside for production of this crop worldwide. The main producers of bananas are India, China, the Philippines, and Ecuador. Ecuador is also the main exporter of bananas, while the United States is the largest importer of these fruits. In several Southeast Asian religions, bananas play an important role, either for their association with spirits and ghosts or for their use as sacrifices to gods and goddesses. In the 1700s, bananas were thought to be bad luck to bring onboard ships. The origin of this superstition seems to be the disappearances of a large number of ships transporting bananas. The most prevalent modern theory for the cause behind these disappearances is methane gas, which can be released by fermenting bananas and which could kill sailors if it built up below deck. Personal care. The banana oil is often used in hair, nail, and skin products for the high volume of vitamins and minerals present in the fruit. Additionally, it can be used to make soap. Dye. Banana peels are also used to produce natural dyes. Fiber. Recently, banana fiber has caught the attention of experts looking for environmentally-friendly methods of clothing and textile production. Banana fiber can be used to make soft, tough clothing with less waste of resources than using cotton. Crafts. Traditionally, banana pseudostems have also been used to make boats, and in fact still are used in Lake Baringo, in Kenya. Banana leaves are also commonly used in tropical areas as makeshift umbrellas and held upside down over the head when a surprise rainstorm springs up. Banana is not only a delicious fruit and a great addition to any smoothie; it is also one of the world's biggest crops and a treasure-trove of medicinal properties and health benefits. Choose My Plate, Why Is it Important to Eat Fruit?